I am co-curating a group exhibit of work created with handmade paper. 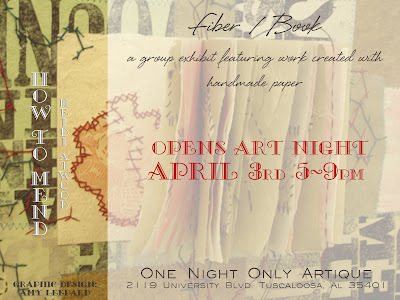 The show opens on Art Night - April 3rd at the One Night Only Artique in downtown Tuscaloosa. 1) An intaglio print of an image of my spinning wheel flyer with Linsey-Woolsey yarn (Linen/Wool blend) on the bobbin printed on Linen/Wool paper. 2) A series of photographs (traditionally printed on photo paper) of the papermaking process with a Handmade Paper Narrative printed on Linen/Wool paper. 3) I also hope to have finished a box set called Handmade in Alabama which is a set of 4 image books, each featuring a different traditional artisan - Book One is Miller Pottery Since 1865 which features my original photography of Eric Miller working in his studio. Book Two features split-oak basket maker Estella Jackson working with her grandchildren in her studio which was built by the Auburn Architecture Rural Studio. Books Three and Four are still in the planning stages - more info and images to follow soon. Printed on handmade bleached Abaca paper. I am beginning to sense that I know more about papermaking than I thought I did. Today, I found myself able to diagnose things without much hesitation. I pay close attention to the characteristics of the paper and the papermaking process. Still I know that there are things that I miss. I know that in my finished paper the alignment of the fibers will reveal exactly where I am in my papermaking and in my life. With the inconsistencies in the finished sheets, my inexperience and the tiny flecks of previously made papers, my linsey-woolsey paper turned out beautifully.